Children get hands on experience in the garden at the exhibits during the 2016 White House Easter Egg Roll on the south lawn of the White House in Washington, DC on Monday Mar, 28, 2016. USDA photo by Lance Cheung. Spring has sprung and April is National Garden Month! It’s time to pick up your trowel and get gardening. Those new to gardening can download community garden and school garden checklists created in partnership with Let’s Move or watch short videos about how-to raise tomato seedlings indoors or the benefits of installing a rain barrel. Growing your own food is a great way to build a healthier plate. USDA’s MyPlate recommends that everyone fill half their plate with fruits and vegetables. With the new People’s Garden database, gardeners can now itemize the amount and type of fruits and vegetables picked from their People’s Garden. Each product is automatically converted to cups using SuperTracker, which helps gardeners better understand how their yield will feed them and others. For the experienced gardeners who want to explore selling their produce, the new People’s Garden map connects them to nearby farmers markets and CSAs. And that’s not all. 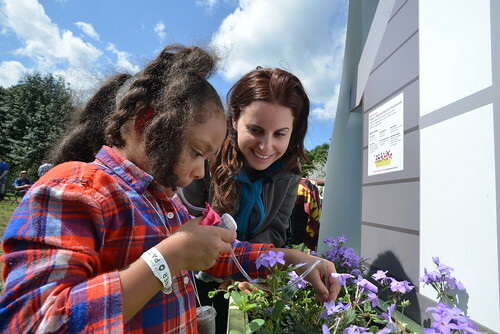 Another exciting addition is the Plant a Window Box for Pollinators online game that has been a big hit at the White House Easter Egg Roll, created in cooperation with the Pollinator Partnership. It’s a fun, interactive tool that shows you how planting native species can increase the quality and amount of food available to neighborhood bees and other pollinators. Check it out. Once you lay the groundwork and get growing, don’t forget to register your food, wildlife, conservation, beautification, education, or training garden with us as a People’s Garden. Since 2009, more than 1,300 partners have volunteered over 200,000 hours in 2,226 gardens resulting in donations of 3.9 million pounds of food. Follow us throughout National Garden Month this April on Twitter @PeoplesGarden and share your garden stories using #NationalGardenMonth. USDA’s Agricultural Marketing Service, Transportation and Marketing Program oversees the People’s Garden Initiative for the Department. We have designed an indoor gardening tower that allows you to grow fresh fruits, vegetables, and herbs all year round - without the use of soil. We have sold many of the Nutritowers to schools across North America and subsequently have developed an in-depth pedagogical package to help teachers use the Nutritower in a variety of cross-curricular activities with their students. How/where can I share more information on our Seed to Harvest program? Your new website does not show any content. Is the People's Garden website no longer operating? Are the resources located somewhere else? @Susan - Thank you for your comment. The People’s Garden website is currently under major redevelopment. We expect the site to be back online with improved services in early 2019. We also expect any prior links to redirect to the appropriate page at that time. Did USDA abandon the people's garden website? Is the initiative also abandoned?? @E - Thank you for your comment. The People’s Garden website is currently under major redevelopment. We expect the site to be back online with improved services in early 2019. We also expect any prior links to redirect to the appropriate page at that time.